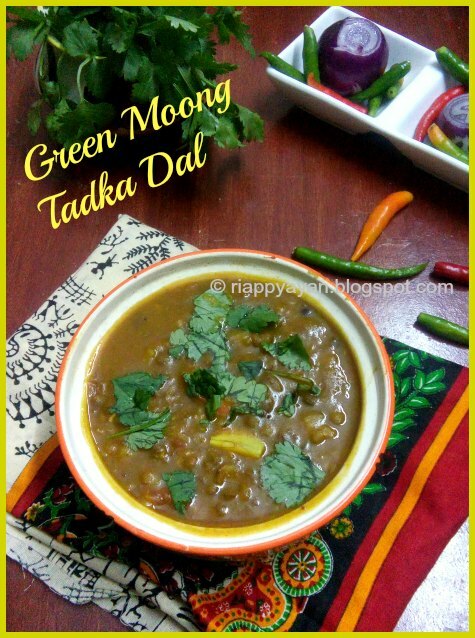 Moong dal especially Green Moong dal or basically moong dal with its cover or husk is very nutritious to our health. 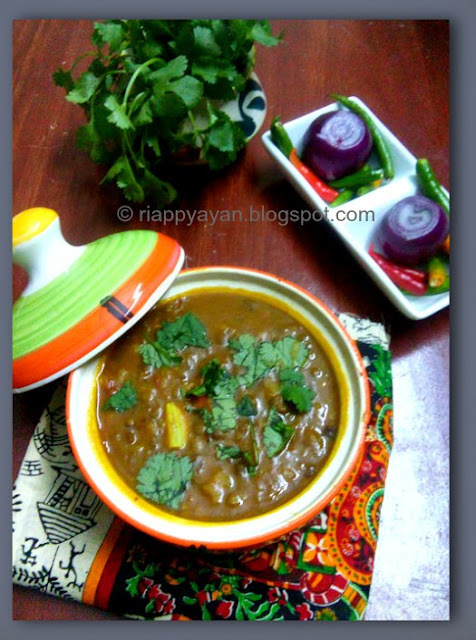 I cook this dal quite often with rice or rotis, this dal tastes great. If you have ever eaten in a Punjabi restaurant or roadside dhabas(small food joints run by mostly Punjabis), you'll see it is the most ordered dish there. My mother used to make this dal quite often, from then I fell in love with this dal. After marriage, I found out that it is my hubby's favorite dal also. Gradually, after trying lots of ways making it, finally I came up to this recipe which just tastes great. So sharing this recipe with you all here. I usually make a simple stir fry of mix-veggies or a salad to go with it. Last week I made a stir-fry with broccoli, mushroom, sweet corn and spring onions, will give the recipe of this too. 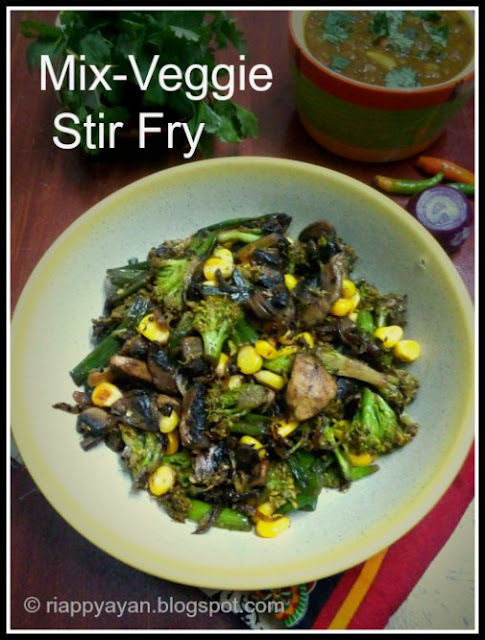 Basically, you can use any vegetables of your choice for the stir-fry. Kasuri methi(dried fenugreek leaves) : 1 tblsp. Soak the dal overnight if possible, otherwise soak for at least 3-4 hours in hot water. Before cooking, pressure cook the dal with a pinch of salt, turmeric powder and 1/2 inch piece of ginger pounced lightly. Cook till done, then remove and mash totally. Heat oil in a pan, temper with a hing(asofoetida) first, then add cumin seeds and then add sliced onions. Saute till onions turn brown, in there add chopped green chillies and garlic paste(4 garlics). Add chopped tomatoes as well. Saute till tomatoes mashed well, then add turmeric, coriander and red chilli powder and 1/4 cup of water. Add a pinch of salt and ginger paste.Mix all the spices properly and cook till oil seperates. Lastly add garam masala powder and mix well. Add cooked dal in the spice paste and give a good mix. Add 1 cup warm water if you want it liquidish. If you like it little dryish, then add little water. Season with salt and kasoori methi. Add slightly pounced garlic cloves in the dal and cover with a lid. Cook for 4-5 minutes in medium heat. Remove from heat when done. Oil : 1 and 1/2 tblsp. Mustard and cumin seed : each 1/3 tsp. Cut all the veggies in medium chunks. Heat 1/2 tblsp. oil in a pan, add the broccoli florets. Stir fry in medium-low heat adding just a pinch of salt. Cover with a lid and check sometimes and stir. Broccoli doesn't take much time to cook. With 5 minutes it will be cooked. Remove from heat and set aside. Heat 1 tblsp. oil in the same pan, temper with broken red chilli, mustard and cumin seeds, when they start to crackle, add sliced onions ad chopped green chillies, saute for a minute, then add mushrooms and spring onions in there. Continue stirring, after sometime, add sweet corns. Add turmeric and red chilli powder and mix well. Season with salt and grated garlic cloves. Lastly add fried broccoli florets, mix well and stir fry for another 2-3 minutes. When all veggies are cooked, remove from heat. 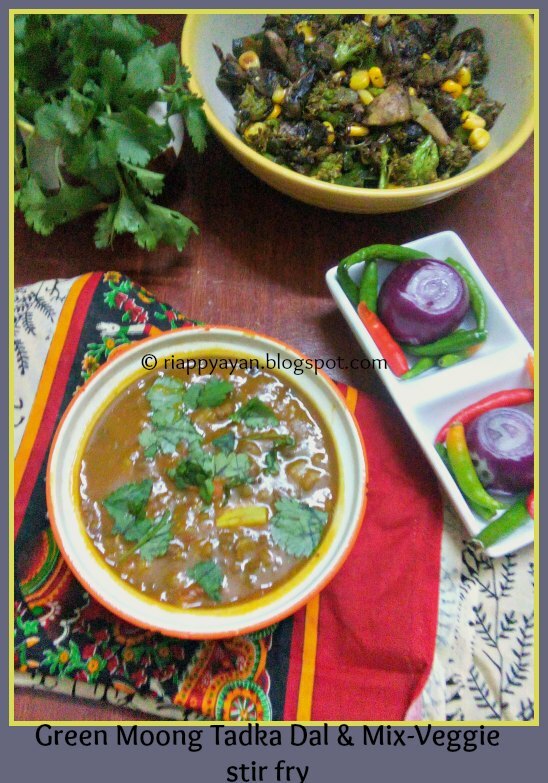 Serve Tadka dal or with any other dal and this mix-veggies stir-fry with hot rice or rotis/parathas.